Coupons for Your Upcoming Move! Note: Coupons Must be Presented to Salesperson Prior to Booking Your Move. Please print the promotion by clicking the link in the picture (below). You can fax the coupon to your moving consultant at 1 (888) 344-5424, or present it to your driver on moving day while booking over the phone. Get $65 Off Your Quoted Price. Any Fair Price by At Least 10%! * Only valid with 6 hour minimum local moves. Seniors, Call Us Today for $50 off Your Move (with Proof of ID). ** Redeemable for $1,100 minimum long distance moves. When the time comes for you to secure a mover for your office move, be sure to request a binding estimate with your inventory. Binding estimates provides you with the cost ahead of time with a price that will not change as long as your inventory matches your quote. A no-nonsense flat rate up front is the most secure option for your business. 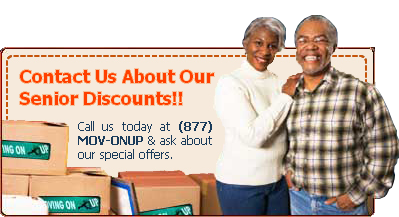 Call us today at 1 (877) MOV-ONUP to move your government branch, agency, corporate office, or small business. Know what to expect and expect the best from Moving On Up™. 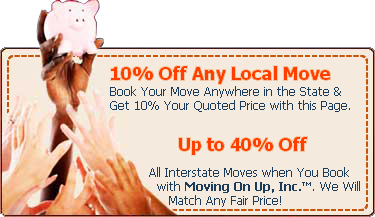 You will be glad that you used a cooperate moving company that knows how to get the move done right.